Angkor Wat at dawn. How it’s meant to be seen. And worth getting up for. It’s a big deal visiting Angkor Wat, the UNESCO World Heritage Site outside Siem Reap, Cambodia. Chances are, for most tourists, there will be one and only one trip to Angkor in a lifetime. The sprawling site is comprised of more than 40 excavated temples spread out over several medieval cities. Due to the popularity and complexity of the site and the relatively short amount of time most travelers devote to the visit, it’s really worthwhile to set up a guide and tour in advance. Here are some travel planning tips for your visit to Siem Reap and Angkor Wat. 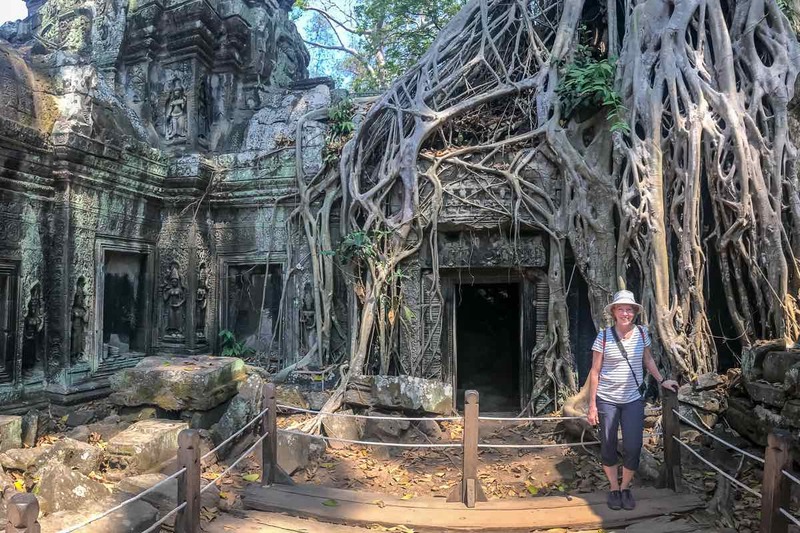 We planned three nights and two full days in the area, and would have been happy to spend another day or two checking out the town of Siem Reap. In advance, we worked with Exodus Travels, not only to secure a guide for our visit to the World Heritage Site, but to build a plan fitting our interests: photography, multiple sites (not just Angkor Wat) and a bit of biking through the area. With a site this large and detailed, it’s good to plan your visit and set some priorities. What is typically referred to as Angkor Wat is actually a complex of cities and temples spread out over 400 square kilometers (155 square miles). Angkor was the capital city of the Khmer Empire, particularly vibrant from 900 to 1200, but inhabited from 802 to 1431. Through decades of archeological digs and research, it is estimated that Angkor was a ‘mega-city,’ home to perhaps a million people over an area the size of present-day Paris. Mind you, this corresponds with the ‘Dark Ages’ elsewhere on the planet. Gods and demons line the bridge over the moat surrounding Angkor Thom. Apart from the temples loaded with historic relief carvings and significant tiered and towered architecture, UNESCO cites the cities’ ‘hydraulic structures’–canals, reservoirs, moats, and dykes–used both for communication and defensive purposes. Curious visitors will learn a lot about the civilization beyond the temples and religious practices. Angkor was inscribed as as a World Heritage Site in 1992. The earliest temples were Hindu temples. Some of these were later converted to Buddhist, and others were constructed as Buddhist centers, depending on who ruled or was invading the region at the time. 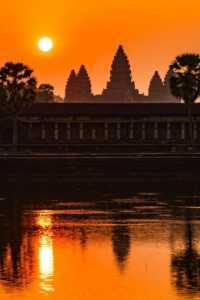 Of course, speaking of expectations, be reminded you’ll be alongside vast numbers of tourists and tourist groups visiting the Angkor Wat World Heritage Site. Temples are in various states of reconstruction or neglect. At pick-up, our guide reminded us to bring insect repellent, sunscreen, water, and hats. Check. Tom remembered his headlamp. I did not. It would have been handy. Reaching the site for sunrise means navigating to that perfect picture spot in the dark. Our guide showed us to a great place. By the time we stopped to wait for sunrise, I could still barely make out the temple towers, even though our guide was pointing right at them. The Lady’s Temple, Banteay Srei, is compact but laden with carvings. Banteay Srei is also known as the Lady Fortress Temple. Built in 967 as a Hindu temple dedicated to Shiva, Banteay Srei features intricately carved, rose-colored stone from the area. The library pediments are worth a good look. Although this is one of the smallest temples (and therefore might feel the most crowded), it was the first major restoration project in the area. Restorations began in the 1930s under the French. The Lady Fortress Temple is an early example of restoration using the anastylosis method, utilizing original architectural details as much as possible. We took our time rounding the central temple a couple times, trying to take in the carvings that cover all surfaces. With a private guide, you can take as much time as you want, where you want. Surrounding the temple, miscellaneous excavated stones are strewn across the grounds, as is common throughout the area. In March the moats are low or nearly dry. 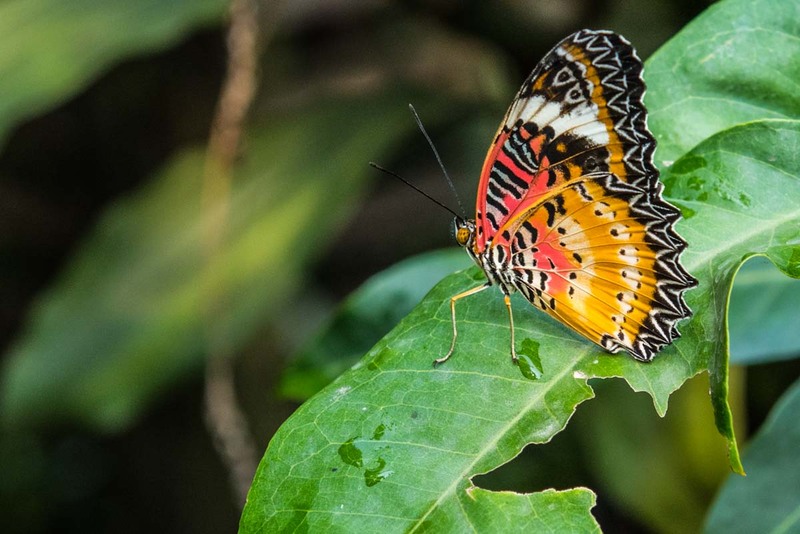 On the way to Banteay Srei, which is 30 kilometers outside Siem Reap, do stop at the Bantaey Srei Butterfly Center. It’s a wonderful operation devoted to restoring butterfly populations, and you can help by visiting. Admission is $4, a bargain for the cause and the photo opps! Bayon Temple is the temple with over 200 gigantic smiling faces, definitely a crowd pleaser. Built in the 1200s as a Buddhist temple, it is also an homage to King Jayavarman VII, successor to Suryavarman II. It’s positioned in the center of the old city of Angkor Thom, a larger city not far from Angkor Wat. Beneath all the huge Buddha smiles, don’t miss the historic bas relief carvings, especially the Sacking of Angkor panels which show the war of 1177 when the Khmer were defeated by the Chams. The sculptures show the pillaging of Angkor, the wounded Khmer King, and the Chams eventual defeat in 1181. This is where people line up for selfies. After much badgering, at a moment with no waiting, I relented. Guides love this. This is the overgrown temple featured in Lora Croft: Tomb Raider, and is sometimes just called the Overgrown Temple. Or the Angelina Jolie Temple. Ta Prohm was originally Buddhist, then Hindu, then abandoned in the 15th Century. It seems this was both a temple and a monastery. A walk through the ruins reveals narrow passageways, enclosed courtyards, and both cellars and ceilings pierced by the roots of trees. According to Lonely Planet, this was one of the few temples whose inscriptions were preserved. Their story claims that nearly 80,000 people maintained or attended this temple. Once we entered the site, we were duly impressed, and glad that our visit–even after a wait of many years to visit Angkor–met and exceeded our expectations. Again, thanks to a professional guide, we took our time, enjoyed the climb to the top without a wait, and were out of the Angkor Wat city site before the hordes of tour groups had entered. 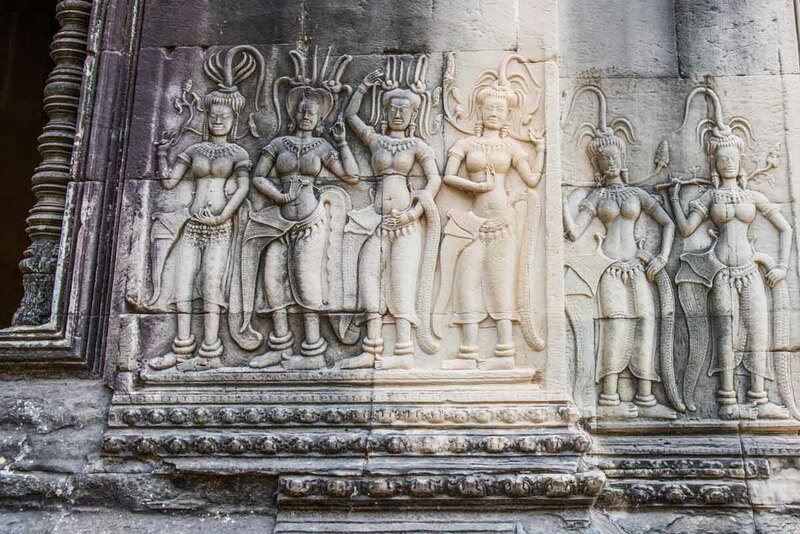 The highlight of Angkor Wat is the 800 meter-long relief carvings of the Apsaras–the dancers or heavenly nymphs. There are nearly 2,000 Asparas depicted, each unique, with changing combinations of gestures, accessories, and hair styles. Angkor Wat, unlike other temples, faces west, not east. That and the counterclockwise direction of reliefs indicate, some think, that this was both a temple and a mausoleum. We left the decision making to our guide, but with a little research, you might want to select another temple or two to visit, more off the beaten path. Of the more than 70 identified temple remains, about 40 can currently be visited. 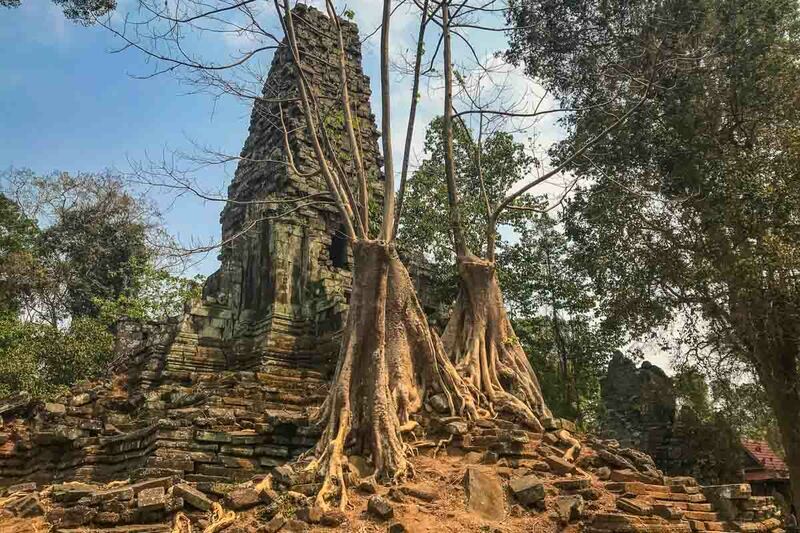 You’ll find temples more than 60 miles from Angkor, great places for sunset vistas, and adventurous backroads routes connecting sites. 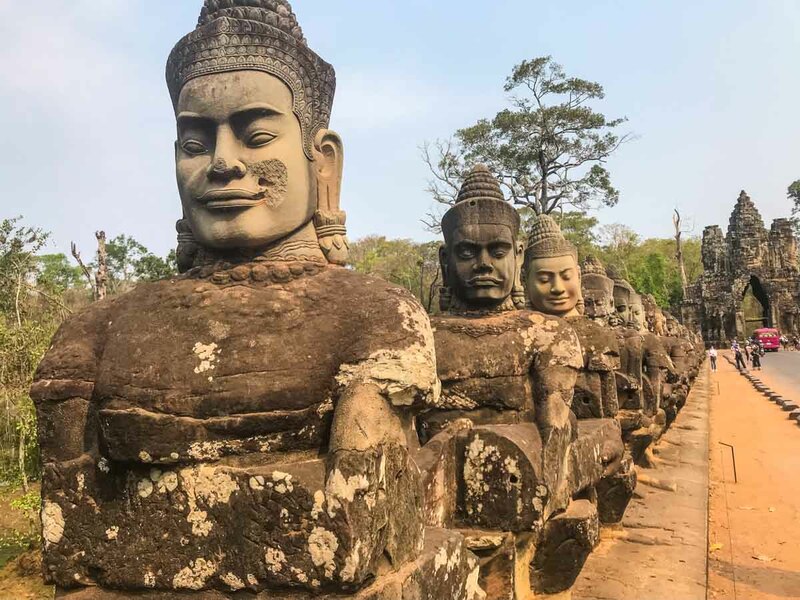 We hopped on bikes from Angkor Wat and just biked a short distance to Angkor Thom, stopping for a close look at the statues of gods and demons lining the bridge over the south entrance moat. Then, rounding Bayon Temple and passing through the ancient coliseum, we ended up on a lovely dirt path through the forest, ending up at Phreas Palilai Temple. Our reward was having this temple to ourselves. We relaxed, walked around, and peered at carvings half hidden by roots and moss. It was only then we realized a local family was preparing an offering at the foot of a nearby (and new) buddha, and that this place was abandoned and in use at the same. 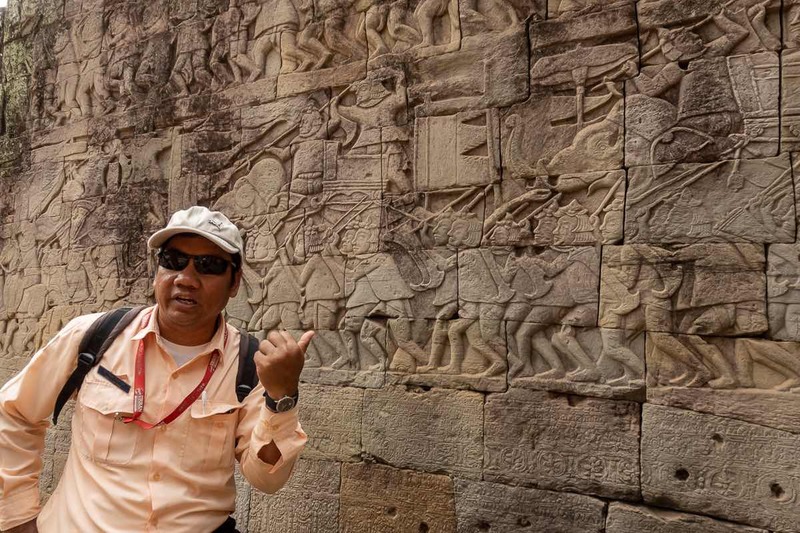 Our guide, Mr. Meas Sokhom, talked about ancient history plus recent and personal history in Cambodia. Apart from leading us around and filling us with details about the sites themselves, our guide, Sokhom, offered us personal details and conversations that helped inform the rest of our visit to Cambodia. Cambodia is even more recently recovering from war than Vietnam. While Vietnam started its peace process in 1975, the Khmer Rouge in Cambodia was a devastating force until 1979. And after that, civil wars resulting from the Khmer Rouge and its shifting alliances caused further displacement, food shortages, lack of urban infrastructure and appalling pain and suffering for its people until 1991. Americans may approach Southeast Asia with a healthy sense of guilt for our involvement in the prolonged war. Oddly enough, Sokhom and other Cambodians were eager to tell us that they don’t blame the U.S., but the King and leaders of Cambodia who allowed the Viet Cong and North Vietnamese Army to hide out in their countryside. Which, of course, led to carpet bombing, counter attacks supported by Thailand, and the placement of thousands and thousands of landmines. We ate breakfast with Sokhom a couple times, though he left us to ourselves at lunch time. Not only did we learn more about Siem Reap and where to eat and shop, but heard his unforgettable story, not unlike others of his age, including forced work, forced military service, imprisonment, and tenuous reconnection with his family, at least those who survived the Killing Fields of the Khmer Rouge. This, too, is why we continue to travel: to hear such personal stories. Bantaey Srei Butterfly Center works with local farmers to protect and grow the butterfly population. Siem Reap wasn’t born for tourism. It was a village all along, bridging the Khmer Empire with the French Indochina era, and hit as hard as any place by the Khmer Rouge under Pol Pot. Locals boast that they’ve long been guardians of Angkor and the temples. 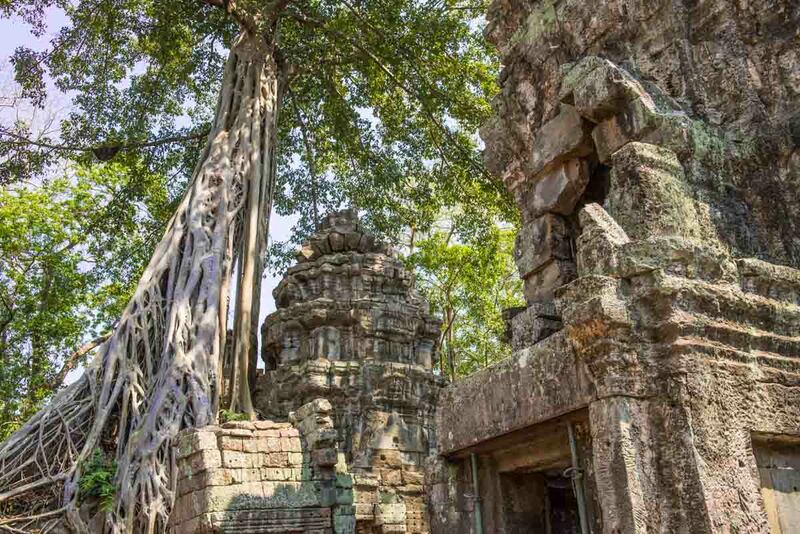 Ever since the French started digging, Siem Reap has been keeping apace with the interest in this, the largest archeological site in Southeast Asia. Of course it’s a mixed bag, balancing–er, relying on–tourism while protecting the site. 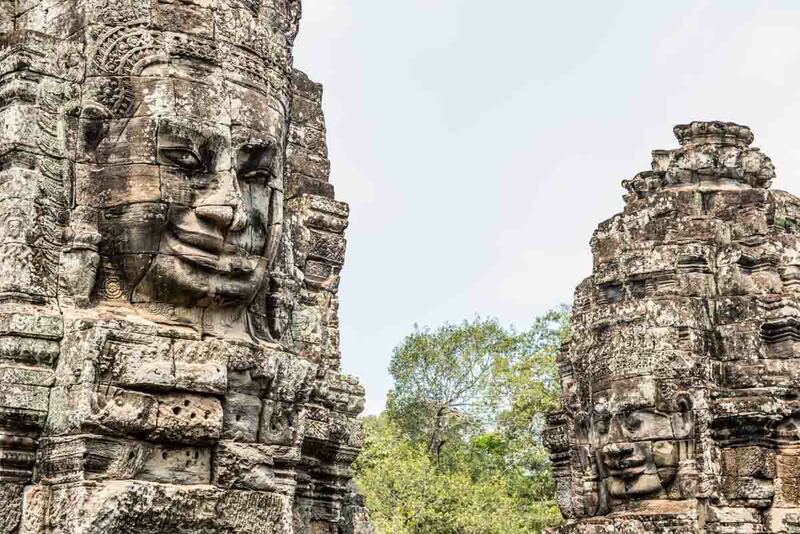 For a quick overview of the impact of tourism on Siem Reap and Angkor Wat, read this 2011 post from Current World Archeology. 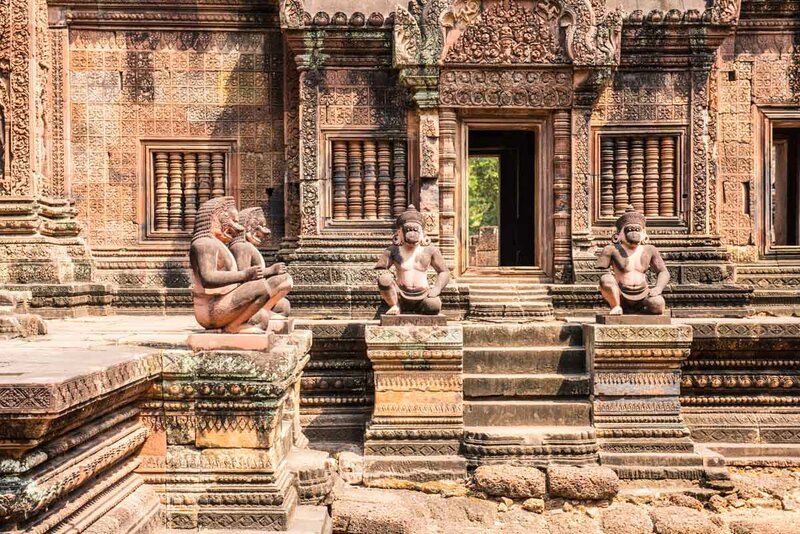 In it, they note there were 5,000 visitors per day to Angkor in 2011 (or about 2 million per annum), with an estimated six million visitors per year expected by 2020. According to Wikipedia, citing TourismCambodia.com, visitors in 2018 numbered 6.2 million. UNESCO, in 1995, estimated capacity at 700,000 visitors per year. The Siem Reap airport opened in 2001 and inaugurated a new terminal in 2006. A new airport about 30 miles out of town will open soon. At any rate, Siem Reap is worth a visit in its own right. It’s walkable and provides great examples of local culture, from food to night markets, without the angst of a major city. Tuk-tuk transport is readily available, and it’s easy to deal in dollars. What can you do to help the local economy? Book your own hotel, a local property. Ask for and honor recommendations from your local guide. And enjoy your conversations with native Cambodians. They will lead you to what’s important. Exodus Travels for a tailormade trip using local guides. Won Residence and Spa, a locally owned hotel with pool, bar and restaurant. It’s a 20 minute walk to center, or a quick tuk-tuk ride. We ended up enjoying the excellent rooftop restaurant every night we were there, met the owner, and talked beyond comprehension to the wait staff. Bong Thom Homestay a locally owned eco-lodge and restaurant. 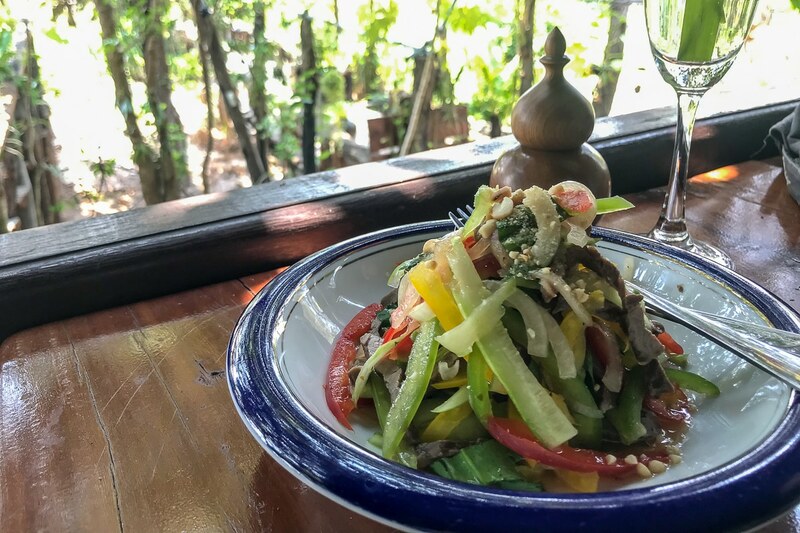 We lunched there, one of our best meals in Cambodia, and surveyed the property. Nice! Korab restaurant in the village of Srash Srang (on the way to Banteay Srei) gets a shout out for its delicious cashew smoothie, which I tried based on Sokhom’s recommendation. AMA Waterways Riches of the Mekong Yes one of the reasons we visited Siem Reap at this time was that we were embarking on this cruise. Worthwhile. Details will follow soon. The moral of the story: Read up, stay local, and utilize your Exodus Tailormade Adventures guide. 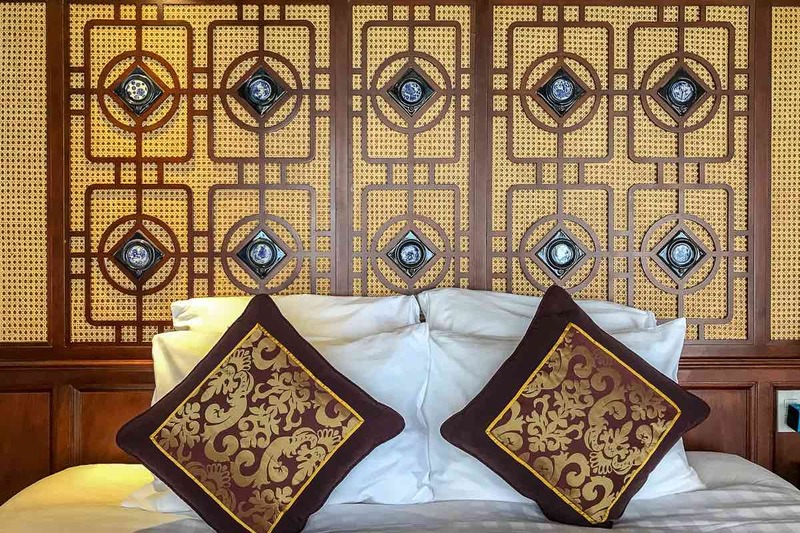 Headboard detail in our spacious room with balcony and seating area at Won Residence. Finding this information useful? Pin this or otherwise share this post using the social buttons up top. Thanks! Do it! I think I might need to return just for the cashew smoothie. We love Vietnamese food, too, especially from the south. And there are lots of cooking class opportunities. Thanks for a comprehensive post. 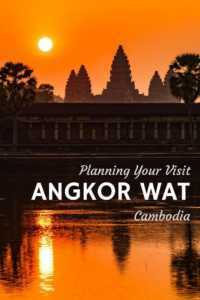 Angkor Wat has been on our list for a while (like most people) and your tips are really helpful, especially the private guide, something Henk and I like to do as well. I guess the subtext travel tip here is to make your own arrangements for tours pre and post river cruise. We’re in the habit of independent travel, and even though we love river cruises, we’re always happy to have time on our own in the cities at either end. David and I visited Angkor Wat in January 2018. It is an amazing site. We found a few things were slightly different to your experience. Passports are not necessary to get your tickets but you must have PHOTO ID of some sort – an official source. We used our New South Wales drivers licences as photo ID. Our passports were safely tucked away in the hotel safe. David, hubby, is not an early morning person therefore we skipped the 5 am start which seems usual and found that later in the morning (9 or 10 ish) the ticket queues had vanished. All the other tourists were back at their hotels having breakfast by then. Thanks, Lyn, for the details of your experience. Sounds like you had a great visit. Incredible if not a bit daunting given the expanse of the site. That you enjoyed sunset within the ruins had to be amazing. Like most, we have it on our list and your tips, especially in using a private guide are invaluable. I especially like the photo of The Lady’s Temple with all its intricacies. Thank you. Thanks, Lori. Hope you get there someday soon! Kristin, your pictures are super! I think your advice regarding booking a reputable guide makes perfect sense. So often it’s not just the complex history, religions and customs of such areas one needs to try to understand, but ‘backgrounders’ shared by locals who offer insights that make us think differently and more deeply. You remind me to double my efforts to get to Cambodia. Thank you! Ursula, you captured the advantage of working with a local guide. 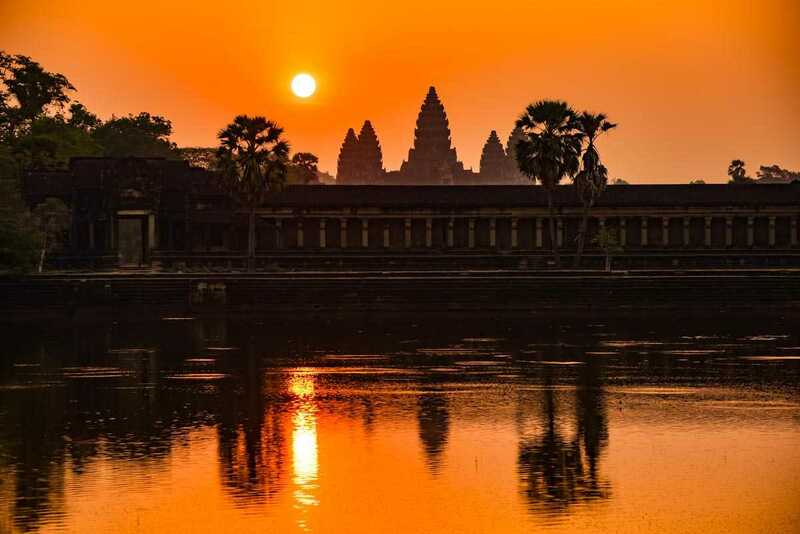 We hope you get to Cambodia soon, and share your take on Angkor Wat here when you do. Loved your photos and what a fabulous amount of information. Booking a guide, especially to get the inside story and more personal information is always a great way to gain a deeper understanding of a place. Thanks for the tips and advice … Bookmarking this post for the day we get to Cambodia. Great, Johanna! We were taken by surprise at all the personal stories we heard. But it make so much sense, since this entire generation was deeply influenced, yes in personal ways.